This brilliant multiplayer game from Supercell is sure to be imitated. The thing about mobile gaming is that you never really know when a big, defining game comes around. Flappy Bird takes over the world out of nowhere. Crossy Road sure was fun and well-made, but we never saw it becoming the smash hit it became. It inspired countless imitators. Candy Crush Saga and its sequels somehow became this generation's defining match-3 game instead of Bejeweled and its brethren. And of all the competitive simulation games, Clash of Clans defined the raiding-strategy genre (and has some awesome exploits and cheats). But there are plenty of alternate universes where some other games are massive smashes instead of these. From day 1 of its soft launch, it became clear right away that Supercell had a hit on its hands. They figured something out that countless MOBAs, first-person shooters, and any other game have failed to do. They made an intense real-time multiplayer game on mobile that engages players and makes money without feeling unfair. It's easy to spend tons of money on Clash Royale, but you'll sink hours into it just because you enjoy it. 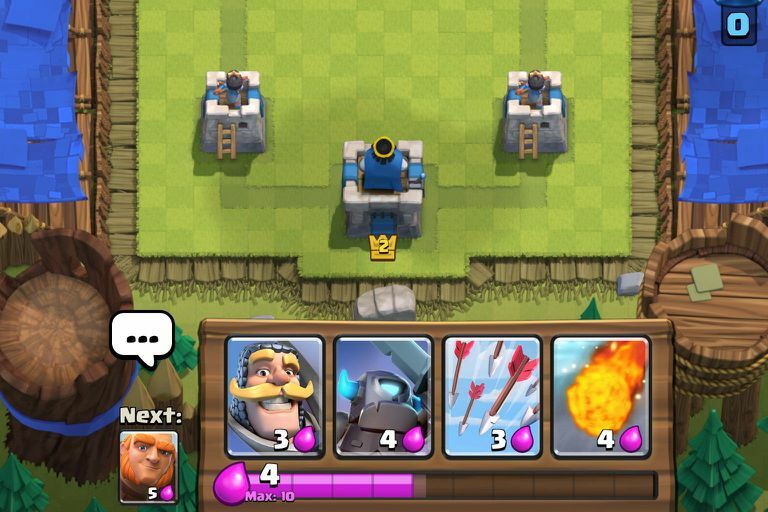 We go in deep about the game in an earlier article, but Clash Royale is best described as a collectible card game meets a real-time strategy game and a MOBA. You have a deck of 8 cards, with 4 in your hand at one time. You use the elixir, an energy unit that recharges over time, to summon cards onto the battlefield. Then, you deploy them to attack the enemy's crown towers in the 2 lanes each having a tower, along with a center king tower. Destroy a crown tower, and you can go after the king tower. Destroy the king tower, and you win, though you have to do so in 3 minutes, with the last minute providing double elixir. Otherwise, the player who has destroyed more crown towers is the victor. If towers are tied, then there's a 1-minute sudden death overtime where the first person to destroy a tower – crown or king – wins. The king tower does more damage to incoming units and hurts harder. What's clever about the gameplay is that it's all so simple to learn and play with. You drop units in, and they follow their behaviors without any other command. Where you place units can be important, but not as much as the lower-level strategy of managing your deck, elixir, and current cards in relation to your opponent's situation. You become knowledgeable about the game at a level where you feel comfortable diving in. Before long, you're joining a clan, experimenting with decks, and getting sucked into the metagame. This happens so fast, you won't know what hit you. And because games only take 3 or 4 minutes, you can feel like you're getting a lot done in a short session. Compare this to many popular multiplayer games, where they can feel overwhelming for too long. Even something like Hearthstone has a steep barrier to entry today. Clash Royale limiting certain cards to a tier of the game helps a lot to make sure that you're not getting an information overload at any point. There are people who will be concerned about pay-to-win aspects in this game. We feel like "pay-to-win" is overblown – even real-world hobbies have analogs for where casual people can do the same at a low cost, but dedicated people can spend a lot of money. Kongregate CEO Emily Greer talks about this when she discusses her figure skating hobby in comparison to free-to-play games. And, that's how Clash Royale works. If you want to play for fun and some degree of competition, you can enjoy it and progress to a certain degree. The game gives you 6 free silver chests per day just for logging in and claiming them, and 1 free gold chest for getting 10 crowns in 24 hours. Then, there are wait timers on opening the chests you win, but still, you can earn more than enough cards to be competitive to a certain degree. The game's matchmaking setting you up against people of similar trophy levels means that you're generally going to have a fair matchup no matter what. Now, if you want to be really competitive, and get high up on the leaderboards, are you going to have to spend a lot of money? Yes. That's kind of just how free-to-play works. It's a long way to the top if you want to rock and roll. You will rarely if ever see anyone who is so far ahead of you that you can't defeat them. The player base and matchmaking are already done well enough that it's not a problem at all. In fact, competitive balance is a surprising priority here. You might not think that to be the case from the company that has made billions off of simulation-style games in Clash of Clans and Hay Day, but even in the soft launch, cards were getting tweaked on a regular basis. There are common cards that still play useful roles, such as arrows. It's not just a game of having all epic cards and winning. Deck building and deploying your cards with intelligence is still important. Even the elixir system is well done. It's this subtle thing where you're always battling to counter opponent moves and to get enough damage in on your opponent without spending too much in the way of elixir. Counter a 4-elixir card with a 3-elixir card and you have gained a small advantage with your limited resource. Send a 6-elixir card, do some major damage to an enemy tower, and force them to spend more than 6 elixir to counter you? Well, good job! This is a genuinely competitive game, no doubt about it. The way you build your deck is important, and you have to plan a strategy. The difference between this and other games is that you have such a lower barrier to entry than other games. An 8-card deck is easier to deal with than a 30-card deck. It also makes it easier to keep track of what your opponent has, especially as decks cycle around. But there's nothing wrong with that! This kind of game should be accessible, and it doesn't do anything to diminish the more complex experiences. And its monetization isn't too different from other CCGs, where buying decks to get cards is the key. Having to collect multiples of cards and upgrade them is key, of course. It just means that there's a smaller, more manageable card pool to play with. We also appreciate the philosophy of offense over defense that Supercell is using for balance tweaks. It's satisfying to cut off an opponent's attacks, sure. But it's more fun to blitz an opponent and crush their towers, no? It's what will keep people interested. No matter what, there are honest-to-goodness strategies and tactics in play here beyond just paying to win. It's a pay-to-compete game but that's pretty much any activity, much less any free-to-play game. Supercell did a miracle here in making Clash Royale be the perfect multiplayer mobile game. Depth and brevity are both here without contradicting one another. Call of Champions we thought had the mobile MOBA formula cracked, but Clash Royale manages to one-up it. We've been playing this game often since the first iOS soft launch happened. We can see playing this again and again for the next few months, maybe even years. We're sure we'll see countless clones due to hit in those months and years, too. Clash Royale is going to be the mobile game that defines mobile gaming for the next few years. Leap Day Review: Nitrome's Game Won't Stop, But Will You?